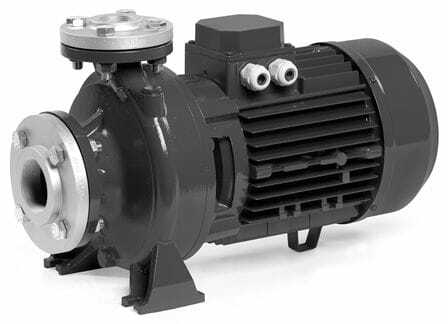 Pumps designed for water supply in air conditioning systems, sprinkler irrigation, pressurization, fire fighting systems, agricultural applications, etc. They have been designed to pump clean liquids without abrasive parts, without solids in suspension, which are neither explosive nor aggressive for the materials of the pump. Monobloc centrifugal pumps manufactured according to the international standards EN 733 - DIN 24255. Wide range from the series 32 to the 100 series and with maximum flow rates up to 240 m3 / h. Pump body, mechanical seal support and impeller made of cast iron, (other materials and features available on request). They are supplied with counterflanges to facilitate the installation of the same. Maximum operating pressure 10 Bar.